I was at City Hall this afternoon for a rally held by the Latino community for New York City's Democratic mayoral candidate Bill de Blasio. Willie Colón, Rosie Perez, Congressman José E. Serrano and Congresswoman Nydia Velazquez were there. Nice to be able to tell Ms. Perez how much I enjoyed her performance in the new film The Counselor. Its a star studded cast with Bardem, Fassbender, Cruz, Pitt, Perez and few other wonderful casting surprises like Bruno Ganz and a terrific performance by Cameron Diaz. Brace yourself for some extreme violence. The acting will blow you away! Rosie Perez speaks at Bill de Blasio rally. 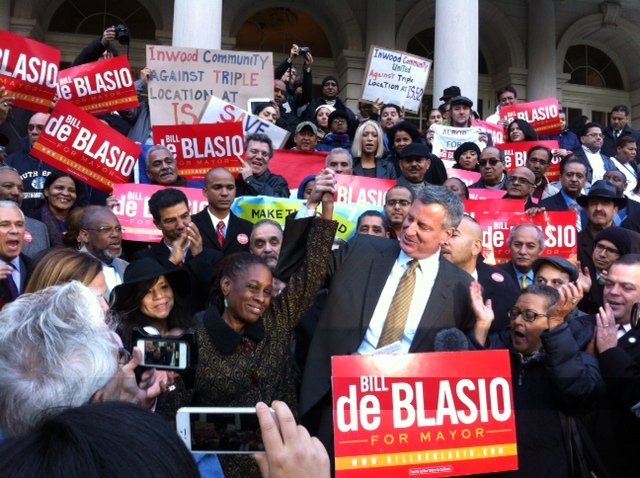 Bill de Blasio and wife attend rally at City Hall.